Plan a trip to the nation's capital to visit museums, historic landmarks and dine at great restaurants. Take the elevator to the top of the Washington Monument for a fantastic view of the city. Head to the Smithsonian Museums to learn about world history and view priceless art. Our list of top romantic getaways in Washington D.C. includes luxury hotels with indoor pools and spas, as well as more affordable options in the heart of the city. Check into one of these perfect romantic hotels in DC. Located in downtown Washington DC, Hotel Monaco offers stylish decor and upscale service in a renovated Registered National Landmark marble building. There is a fitness center, 24-hour business center, complimentary high speed Internet access, evening wine reception and special services for pets. There are 183 guest accommodations decorated with comfortable furnishings and original vaulted ceilings or segmented arched ceilings. Poste - Moderne Brasserie serves modern American cuisine and seats 174 guests. The restaurant has an exhibition kitchen and outdoor seating in the courtyard during the warmer season. 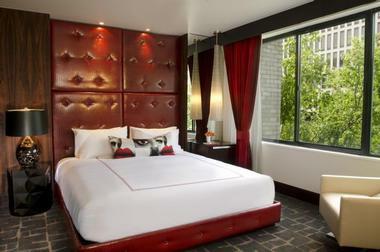 Donovan House is a stylish boutique hotel, conveniently located in the middle of the Thomas Circle. 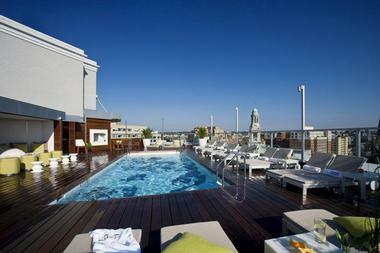 The hotel offers chic public spaces, a bustling rooftop lounge, summer rooftop pool and a gourmet restaurant. This is a Kimpton brand hotel which means that you will have access to all of the services the group is known for, including its pet-friendly policy and amenities for kids. The rooftop pool is generally open in the summer, from Memorial Day through Labor Day. 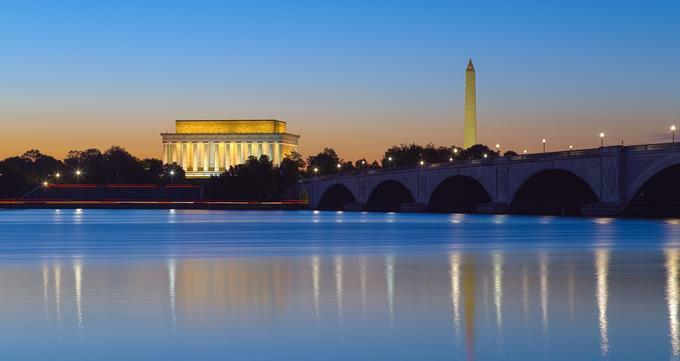 You will be close to the White House and other city city attractions such as the Walter E. Washington Convention Center, the Washington Monument and the 14th Street Corridor. The property has 193 guest rooms and suites with floor-to-ceiling overlooking Thomas Circle, contrasting dark wood and white walls, Sferra bed linens, iPod docking stations and Cocoon spiral showers. A club chair and writing desk in each room make them comfortable for both leisure and business travelers. There are four types of suites to choose from - King Suite, Premier Suite, Executive Suite, and the Donovan Suite. If you need more space or are planning to host a party, book the 1,230 square foot Donovan Suite which has a stylish living room with hardwood floors, spacious seating area and adjacent powder room. There is a separate kitchenette and a dining table which seats eight people. Zentan is an Asian-themed restaurant with vintage mirrors from China and neutral tones. Choose from sushi and kushiyaki, Salade Chinoise, Mongolian rack of lamb with cardamom and caramelized black cod. The hotel offers a private dining room for parties and special celebrations in the nation's capital. During the summer, dine outdoors at DNV Rooftop Pool Bar with stunning views of the city. Take the elevator to the top of the hotel and enjoy the view while you sip cocktails. The rooftop lounge is reserved for hotel guests during the daytime. Pick from massage treatments, body treatments, facials, and hand & body treatments at the in-room spa. The spa uses organic and natural ingredients that work in harmony with nature to nourish the senses and your skin. The hotel has a fitness center and gym for yoga workouts and strength training. The hotel offers an all-inclusive wedding package. The wedding specialist plans every detail: flowers, the wedding cake, photos, menus, post-wedding brunch, looking after out-of-town guests and more. Room rates start at $99 USD per night. 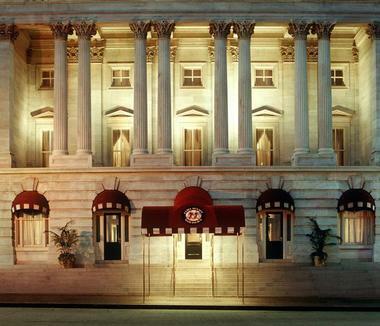 The St. Regis Washington, D.C. is a luxury hotel located just two blocks from the White House. Offering five star service, signature St. Regis Butlers, and elegant dining, the hotel has been visited by every American president. Book a room at this historic hotel and immerse yourself in American history. 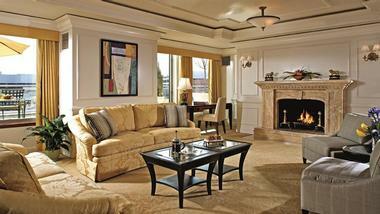 The St. Regis has 175 guest accommodations decorated with antiques and custom-designed furnishings. There are several signature suites, some named after famous people. The Caroline Astor Suite is named after Mrs. Astor, the mother of the St. Regis founder, John Jacob Astor IV. Luxury amenities include 24-hour room service, 24-hour Fitness, complimentary shoeshine, morning coffee or tea, and more. The Butler Service is offered to guests staying in one of the 25 luxury suites. The butlers are known to be able to secure even the most coveted restaurant reservation. This service has been a tradition for over one hundred years. The signature restaurant Adour serves breakfast and dinner. The Hotel Bar is famous for its signature Champagne cocktails. Room rates start at $510 per night. The landmark Hay Adams hotel, originally designed in the 1920s, is located in Lafayette Square, just across from the White House. The hotel has been completely redone and equipped with luxury facilities and amenities, including Custom Frette bed linens and bath towels, Etro bath amenities, and high speed internet access. The property is located about four blocks from the National Mall, and ten blocks from the Capitol Building. The hotel takes its name from two notable men: John Hay, private assistant to President Abraham Lincoln and later secretary of state, and Henry Adams, an acclaimed author and descendant of U.S. Presidents John Adams and John Quincy Adams. Business travelers can take advantage of the 24-hour business center and a complimentary local morning town car which can be requested from the concierge. There are 145 guest rooms, including 20 suites, some with views of famous landmarks. Guest accommodations have been renovated and decorated with fireplaces and elegant ceilings. All of the guest accommodations have marble bathrooms, and several feature a balcony. Elegant Frette linens, microfiber bathrobes and slippers, goose down duvet and pillows, and hypo-allergenic pillows available on request, provide all the modern comforts. 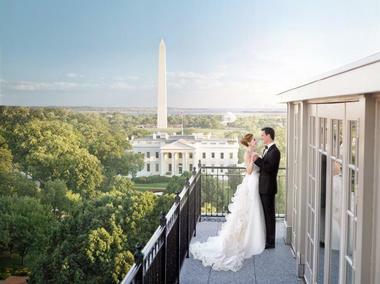 One-bedroom and junior suites have a view of the White House, Lafayette Park, or St. John's Church. Suites at the Hay Adams hotel range in size from 500 to 1,000 square feet. The hotel also offers a luxurious honeymoon suite. Elegant dining is offered in the Lafayette Room with windows overlooking the city. The Lafayette Room serves breakfast, lunch, dinner and Sunday brunch. Off the Record Bar serves casual dinners and is frequented by locals and hotel guests alike. The hotel also offers 24-hour room service to its guests. The ten-story Fairmont Washington, D.C. is a luxury hotel located in Downtown Washington, minutes away from the White House, the Capitol, the Kennedy Center, and numerous other attractions. Popular with Hollywood celebrities, the hotel also appeared in some of the scenes in the movie Enemy of the State. The hotel provides a calm environment to its guests, featuring a tranquil garden courtyard, several restaurants and bars and a 17,000 square-foot health club. The health club is furnished with exercise facilities, lap pool, squash and racquetball courts. If you are planning an event, the hotel has more than 28,000 square feet of meeting space, including the elegant Grand Ballroom with crystal chandeliers. The Ritz-Carlton, Washington, D.C., located at 22nd and M streets, is a romantic getaway known for its attentive service and stylish amenities. There are 232 rooms, 32 suites and 35 Club Level rooms with views of the city or the courtyard. Hotel guests enjoy 24-hours room service, complimentary overnight shoeshine and complimentary morning newspaper. The Club Level rooms include five food and beverage presentations daily, a great romantic vacation idea. Hotel guests have access to the Sports Club/LA, a 100,000 square foot fitness, spa and sports complex. If you are planning a special event such as a party or a wedding, the property features one of the largest ballrooms in the D.C. area. Westend Bistro by Eric Ripert, the famous 3-star Michelin chef at New York's Le Bernardin, serves dishes prepared using fresh local ingredients. 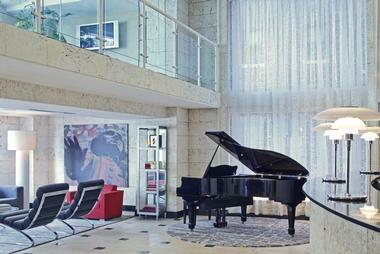 Hotel George in Washington DC is an ultra-modern getaway located in the Capitol Hill's business district, adjacent to the U.S. Capitol Building. The building has a vintage 1928 facade and modern interiors, including originally commissioned artwork, chrome and glass tables, and beige seating. There are 139 guest rooms and suites with custom-designed furnishings, signature silkscreen prints and a granite-topped work desk. The marble bathrooms include terry spa robes. If you want to work out while traveling, take advantage of the complimentary in-room yoga program that includes a mat, block, strap, and all-day yoga channel. Bistro Bis, adjacent to the property, serves classic French bistro fare. Room rates start at about $230 per night, depending on season and availability. Hotel Rouge is a boutique luxury hotel located on Embassy Row in downtown Washington, D.C. Bar Rouge is famous for its creative menu, Late Night Cocktails, and ultra-modern style. 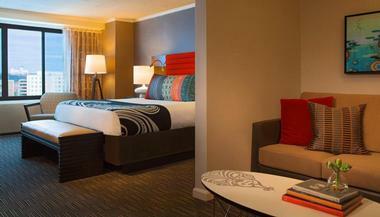 There are 137 guestrooms furnished in bold style with modern amenities. 15 specialty rooms include Chill, Chat, or Chow guestrooms. Chat rooms feature Mood lighting, high-tech computer system and unlimited high speed internet access. Chill guestrooms come with two 27 inch Sony Vega flat screen televisions, a Sony PlayStation2, mood lighting, and lounge seating for two. Chow rooms have a stainless steel kitchenette with microwave and refrigerator and a bistro dining table. This pet-friendly getaway has a fitness center, 24 hour valet parking, and a concierge. There is also a complimentary bloody mary bar and cold pizza.Room packages start from about USD $149 per night. 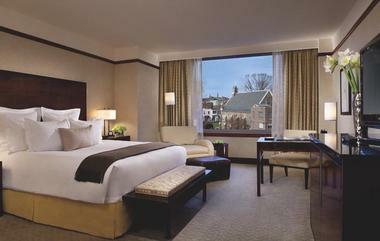 Located in Washington DC's historic Georgetown neighborhood, The Ritz-Carlton, Georgetown offers a great way to combine a city getaway with relaxing spa treatments at its Boutique Spa. Whether you are trying to overcome jet-lag or relax after a day of work, the spa offers a range of treatments, a steam room, a sauna and an exercise facility. Interior features modern furnishings, combined with moss green, gold and rich red colors of the draperies and carpets. There are art exhibits by Marco Breuer, Sarah Morris, David Nash, Michel Rovner, Seiko Tachibana and other artists. There are 52 guest rooms and 29 suites, many with scenic views of the city. If you have to do work while staying at the hotel, all rooms have high-speed Internet access and a Technology Butler on call should you need help. The 70-seat signature restaurant, Fahrenheit, serves classic dishes with a twist. The restaurant is situated on the top floor of the historic building with turn-of-the-century brick walls. Before dinner, stop at the Lobby Lounge which serves cocktails in an intimate setting. Weekend rates start at $399 per room, per night; from $549 on weekdays. 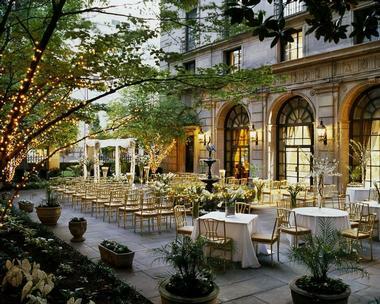 The Hotel Madera is a luxury boutique hotel located in the Dupont Circle neighborhood of downtown D.C. Specialty guest rooms offer travelers something unique to look forward to. If you are a fitness addict, book one of the Cardio Rooms with a treadmill or exercise bike. For those who would rather relax listening to music or watching TV, Screening Rooms feature a second TV, DVD player and DVD library. The Nosh Rooms come with a mini-kitchen, breakfast-in-bed trays, and a grocery shopping service. The Flash Rooms include an IBM computer station from which you can surf the web. There are has 82 guestrooms, including seven specialty rooms. The guestrooms feature complimentary high-speed Internet access, Aveda bath amenities, mini bar, coffee maker, and CD player. You can also check in with your pet with you. Firefly is an 85-seat modern American Bistro located adjacent to the property. The property is a 15-minute drive from Reagan National Airport and 45 minutes from Dulles International Airport. Rates start at around $129 per night. The White House is one of the most iconic buildings in the world and the home of the US President and First Lady. Go to 1600 Pennsylvania Ave. to view the building exterior or apply for tickets to take a self-guided tour of the building (the application can take a while to process, so be sure to plan well ahead of time). The National Mall is a long open space that connects the Washington Monument to the U.S. Capitol Building. There are several major attractions that can be found on the National Mall: The Washington Monument, The U.S. Capitol Building, Smithsonian Museums, National Gallery of Art and U.S. Botanic Garden. There is such an amazing collection of things to see at the Smithsonian Museums that you can spend several days here. Admission is free. There are 130 million works of art, specimens, historic artifacts, fossils and more. The Smithsonian Museums are made up of 19 museums and galleries, so you may have a hard time deciding which one to see first. If you are traveling with kids, the Smithsonian National Air & Space Museum is sure to please, offering the largest collection of aircraft and spacecraft in the world. There is also an IMAX theater and a planetarium. A memorial to George Washington, the first U.S. president, the Washington Monument is the tallest structure in the city. Visitors can reach the top via an elevator and enjoy a spectacular view of the city and several of the major landmarks, including the White House, the Thomas Jefferson Memorial, the Capitol Building and the Lincoln Memorial. The U. S. Capitol Building is where the Senate and the House of Representatives meet. Visitors can watch Congress in Session with a special pass from the Visitor Center. The U.S. Botanic Garden on the National Mall features a collection of 4,000 plants. Bartholdi Park is a must see with its beautiful flower garden and a fountain created by the same French sculptor who created the Statue of Liberty.